Here at MAD Ideas in Surrey we specialise in brochure design, as well as creating booklets and marketing materials for events, organisations and businesses. We’ve worked with a wide variety of clients in many different market sectors and helped to design brilliant publications including brochures, folders, programmes, newsletters and e-zines for local authorities, educational establishments and businesses. Here’s how we do it. After receiving your copy, we review it and then pull it all together. We then create an easy-to-read layout and can also arrange photography, so that your brochures and booklets feature really eye-catching images. We ensure that the design of your publications are stylish and on brand, ensuring information flows well. We can create striking graphics and icons to help guide the reader. Specially commissioned brochures such as the Oxted and Horley Carnivals, Heritage Open Days, The Iron Railway and our favourite Queen’s Jubilee Celebration programme have an excellent retention rate due to their souvenir status and community feel. These brochures often carry a special theme and as part of our creative process, we’ll work with the client to bring their theme alive. This can include the development of an eyecatching front cover brochure design in their style and theme, impactful graphics and assistance with fun facts and copywriting. From quirky, heritage to fun, these brochures bring the community together and often attract a wide readership from our younger audiences to parents, schools, community groups, charities and businesses, therefore we are mindful that layouts and content is relevant to all of these audiences, incorporating information from a wide variety of stakeholders before we get creative. We understand our clients’ needs for a professional image and stylish communications which stand out from the rest. A reason why our clients love working with us time and time again is because they know we’ll always deliver something different and fresh. 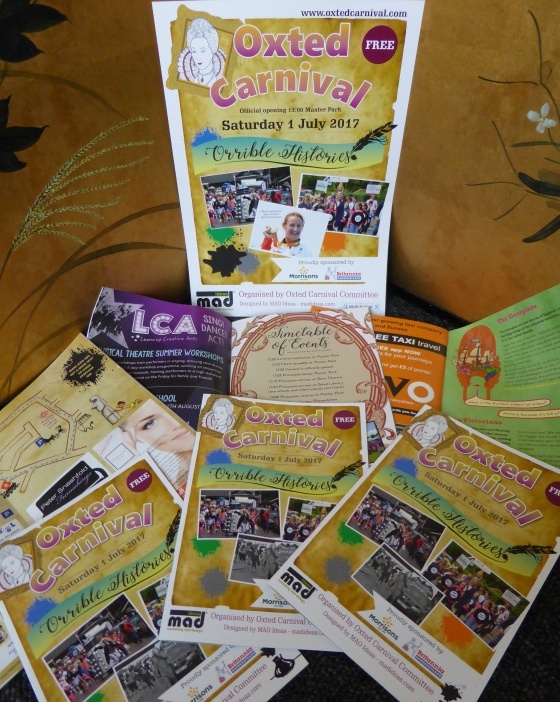 If you’re looking for brochure design ideas and inspiration, check out these brilliant brochures and booklets that we created for Surrey’s Oxted Carnival. Oxted Carnival is an annual event featuring colourful floats and incredible people. The event was opened by Anne Dickins MBE and MAD Ideas created the specially themed community brochure. The chosen beneficiary of the Carnival was the Breck Foundation and MAD Ideas donated £300 in support of their work. Find out more about our brochure design and booklets for businesses and communities. Contact MAD Ideas today. Together we can make a difference!